The global market for corrugated boxes is observing a tremendous growth in line with the development trends of the packaging and converting industries. Several factors, such as the rising demand for corrugated boxes from logistic applications and the fresh food and beverages, electronic goods, and the home and personal care goods industries, the increasing preference for sustainable packaging among consumers, and the remarkable progress of the e-commerce industry, are boosting this market substantially across the world. By 2017 end, the opportunity in this market is expected to reach a whopping sum of US$96.60 bn. Rising at a CAGR of 3.60% between 2017 and 2022, the market is projected to increase further to US$115.15 bn by the end of 2022. The increasing industrialization and the subsequent rise in the trade activities in emerging economies, such as India and China, is likely to propel this market over the next few years. Broadly, the global market for corrugated boxes is assessed on four fronts: The source of the material, end user, packaging form, and the type of the board. Based on the source of the material, the market has been classified into virgin fiber and recycled fiber. Among the two, recycled fiber is more in demand and the trend is anticipated to remain so over the next few years. By the end user, the market has been categorized into the food, beverages, tobacco, healthcare, personal care and cosmetics, homecare and toiletries, electronic and consumer durables, E-commerce, and the chemical and fertilizer industries. Corrugated boxes are mainly utilized to pack food and beverage products. The demand for these boxes has also increased in the personal care and cosmetics industry. However, it’s the E-commerce sector, which is providing the most promising opportunities for the growth of this market. On the basis of the packaging form, the market has been divided into primary packaging and secondary packaging. Single wall, double wall, and triple wall are considered as the main types of the board available in this market. The worldwide market for corrugated boxes is also analyzed on the basis of its geographical spread. Latin America, Asia Pacific excluding Japan (APEJ), Japan, North America, Europe, and the Middle East and Africa (MEA) are considered as the key geographical segments of this market. Asia Pacific excluding Japan has been dominating the global market and is expected to remain doing so in the near future, thanks to the increasing business and trade activities in this region. The APEJ market for corrugated boxes is projected to expand at a CAGR of 4.10% during the period from 2017 to 2022. Among other regional markets, North America and Europe are expected to report a noticeable rise in the demand for corrugated boxes over the next few years, thanks to significant increase in E-commerce sector and the subsequent preference for online shopping among consumers. The presence of leading vendors in is also anticipated to benefits these regional markets in the near future. The global market for corrugated boxes is highly competitive, thanks to the presence of a large pool of players. Stora Enso Oyj., International Paper Co., Smurfit Kappa Group Plc., Pratt Industries Inc., Sonoco Products Co., Huhtamaki Oyj, WestRock Co., KapStone Paper and Packaging Corp., DS Smith Plc., and Georgia Pacific LLC are some of the key vendors of corrugated boxes in the global market. 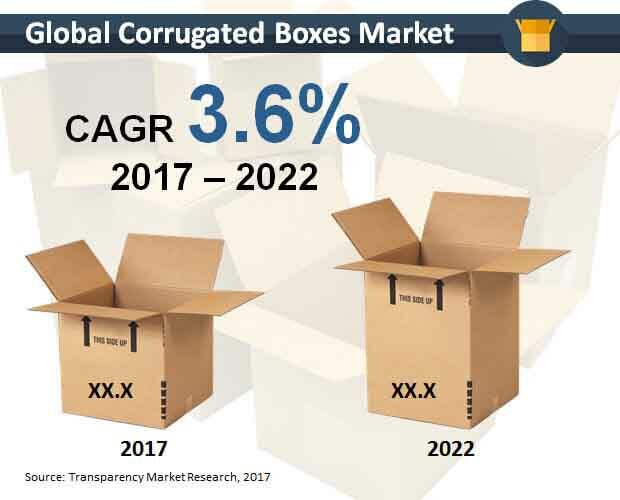 Of late, the global market for corrugated boxes has been witnessing a surge in the valuation and is expected to remain observing so over the next few years. In this research report, an in-depth and strategic analysis and the growth forecast of the worldwide corrugated boxes market for the period between 2017 and 2022 is offered to readers. Under the scope of this research study, the assessments of various segments in this market that are differentiated on the basis of the efficiency, sector, capacity, and the geography, are included. The report, further, provides a comprehensive assessment of several factors, such as the driving factors and limiting forces, as well as lucrative opportunities, which will influence the growth of this market in the near future. Apart from all these factors, the key trends, which impact the overall growth of this market have been identified in this study. Furthermore, an exhaustive assessment of this market, together with the estimations regarding its growth during the forecast period has also been discussed at length in research report. Together with this, it also concentrates on the rise in the demand for various corrugated boxes across the world in the years to come. The report consists of in-depth evaluation of the performance of various segments in the global market for corrugated boxes, analyzed on the basis of the source of the material, end user, packaging form, and the type of board. Based on the source of the material, the market has been classified into virgin fiber and recycled fiber. By the end user, the market has been categorized into the food, beverages, tobacco, healthcare, personal care and cosmetics, homecare and toiletries, electronic and consumer durables, e-commerce, and chemical and fertilizers. In terms of the packaging form, the market has been bifurcated into primary packaging and secondary packaging. Based on the type of board, the market is divided into single wall, double wall, and triple wall. On the basis of geography, the worldwide market for corrugated boxes has been segmented into Europe, Asia Pacific excluding Japan (APEJ), Latin America, the Middle East and Africa (MEA), North America, and Japan. Moreover, the analysis of the performance for the key countries, such as Canada and the U.S. (North America), Mexico, Brazil, and Argentina (Latin America), Italy, Germany, the U.K., France, and Spain (Europe), India, China, Malaysia, Thailand, Australia and New Zealand, and the Rest of APEJ (APEJ), GCC countries, South Africa, Israel, and the Rest of MEA (MEA), and Japan have also been presented in this research report. Further, the research study presents a qualitative assessment of the factors responsible for driving as well as restraining the growth of the global corrugated boxes market in each of these regions. It also discusses the regional or country specific trends, which influence the overall market globally. For better decision making, the competitive evaluation and the profile reviews of the key players in this market have been covered within the scope of this research study. Along with this, the respective market share, prominent developments, and key business strategies, adopted by the key participants for the progress of their businesses have also been studied thoroughly in this research report. Stora Enso Oyj., International Paper Co., Smurfit Kappa Group Plc., Pratt Industries Inc., Sonoco Products Co., Huhtamaki Oyj, WestRock Co., KapStone Paper and Packaging Corp., DS Smith Plc., and Georgia Pacific LLC are some of the key vendors of corrugated boxes in the global market.